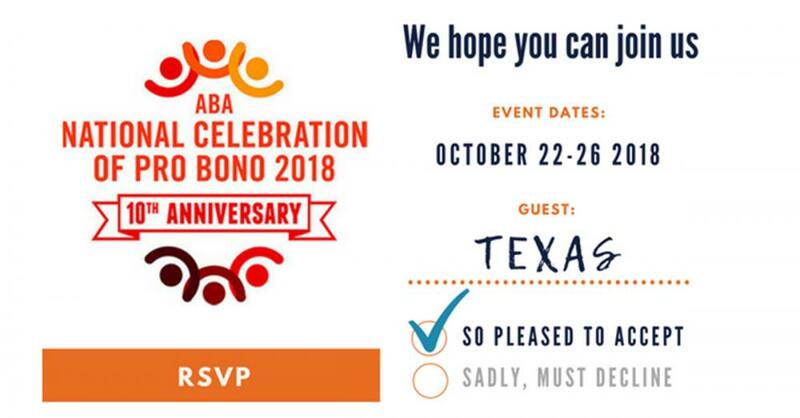 Texas is RSVP’ing YES to pro bono week this year. How about you? The year marks the 10th anniversary of National Pro Bono Week, October 22-26. ABA President Bob Carlson is encouraging organizations to plan and participate in events focused on disaster resiliency. Disaster survivors face countless legal issues — from insurance disputes, FEMA appeals, landlord-tenant disputes, consumer fraud, health and education issues, and so much more. 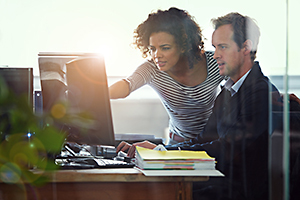 Even before a disaster strikes, communities need legal assistance with disaster preparedness through business continuity planning, securing title documents, meeting insurance needs, and other assistance. How can you get involved in October? Following the impact of Hurricane Harvey on the Texas coast, attorneys found an easy way to participate in pro bono by volunteering with Texas’ new online legal advice clinic, Texas Legal Answers. It took just three minutes to sign up for www.TexasLegalAnswers.org, under Volunteer Attorney Registration, and within the first month following the disaster there were Harvey questions hitting the queue. To date, Texas Legal Answers has received 65 direct questions in the natural disaster category with hundreds more coming in that are indirect legal issues that arose following Harvey. With an average question taking just 20 minutes for an attorney to answer, you can easily log pro bono hours during pro bono week and empower Texans to receive access to justice anywhere you have internet access. Maybe while you wait for your Frappuccino? Or while you wait for your oil change? For every question answered during pro bono week, volunteers will receive an entry to win a new Kindle Fire – generously donated by Westlaw – and a Pro Bono Texas swag bag. Can you #Give20Minutes? How about daily social media posts, covering the week? You could focus on how pro bono legal assistance can help during a disaster or ideas on disaster preparedness for attorneys and their practice. Whether it is physical space considerations, network and phone backup ideas, or any statewide or national resources that are available to assist with technological needs following a fire, flood, etc., y’all have the resources and knowledge base – share it! Need a starting point for ideas? Check out the ABA’s Committee on Disaster Response and Preparedness page here. If not social media, how about writing a short blog post for the Texas Bar Blog? Again, focusing on the above topics and connecting it to national pro bono week. Don’t have enough time in the day to plan your kid’s fall soccer schedule, let alone build something for pro bono week? Let someone else do the planning and you can simply show up for a pro bono week event near you. Watch over the coming weeks, as organizations add events to the National Pro Bono Week calendar. Already doing pro bono, but looking for some resources to make it a tad easier? Need a mentor for a case that is outside your practice area? Maybe you haven’t dipped your toe in pro bono, but now you are ready? Texas has your back with ProBonoTexas.org. 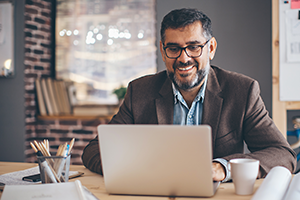 It is a one-stop shop for all things pro bono – including ways to find new pro bono opportunities, a resource library to help you find those answers for Texas Legal Answers, and Westlaw Doc & Form Builder to maximize your efforts when assembling documents for your pro bono clients. Pro Bono Texas will be pushing out social media posts, giveaways, fun facts, etc. across pro bono week on Facebook and Twitter. Stay tuned for announcements and event highlights from across the state. Do you know a pro bono rock star or are you yourself a pro bono enthusiast? Give us a shout here! Hannah Allison is the pro bono programs administrator for the Legal Access Division of the State Bar of Texas and manages Texas Legal Answers. If you have questions or would like to chat about all things pro bono, you may contact her at probonotx@texasbar.com.